One of nine AIA 2019 Awards recipients for interior architecture, the Apple Upper East Side project was handled by noted architectural firm Bohlin Cywinski Jackson. Located at the corner of East 74th Street and Madison Avenue in New York City, Apple Upper East Side opened for business in 2013. The neoclassical U.S. Mortgage & Trust Company Building building was originally designed by Henry Otis Chapman in 1922. Described by the AIA as a "beautifully proportioned space highlighted by tall windows, elegant details, and an airy stateliness," the banking hall and its underpinnings slowly deteriorated as decades of alterations detracted from its original elegance. Over the years, partitions and a hung ceiling were installed as important architectural elements were removed. BCJ was tasked with the preservation and restoration not only of the building's exterior, but also its interior, including new spaces in a cellar that described as a maze of vaults and load-bearing walls. Designers restored and preserved original elements where possible, though certain pieces were missing or beyond recovery. In such cases, BCJ referenced photographs, drawings and "historic precedent" to inform the design of new, bespoke installations like chandeliers that illuminate the former bank's interior. The culmination of BCJ's work is a unique mix of old and new. Apple's typical wooden furniture displays ultra-modern consumer electronic devices in a nearly hundred-year-old setting. As noted by the AIA, the original banking screen and vault doors were left in place as a nod to the building's financial beginnings. The main vault, complete with New York Safe & Lock door, was converted into a VIP room that initially served as an area for Apple Watch try-on appointments. 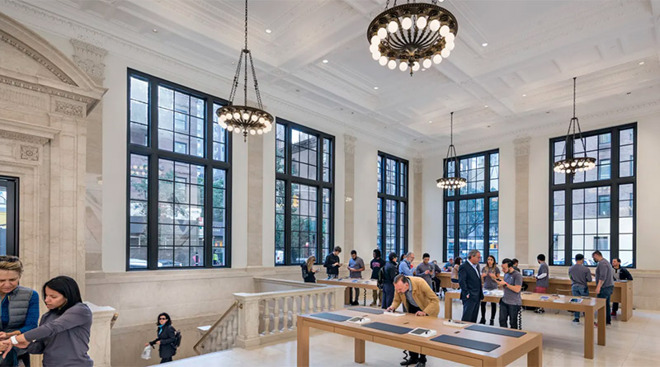 Apple Upper East Side was among four Apple stores — Apple SoHo, West 14th Street, Upper East Side and Grand Central Terminal — recognized by the New York City Landmarks Conservancy's 2016 Chairman's Award for "marrying modern technology with distinguished architecture." Apple was granted the honor in recognition of preserving and restoring notable historic structures in New York City. BCJ, like other renowned firms like Foster + Partners, is a frequent Apple collaborator and has worked with the tech giant on various retail in the past including a flagship in Osaka, Japan, and a Stanford University store. More recently, the firm designed a new Apple store location in Brooklyn, its seventh New York City project for the iPhone maker.